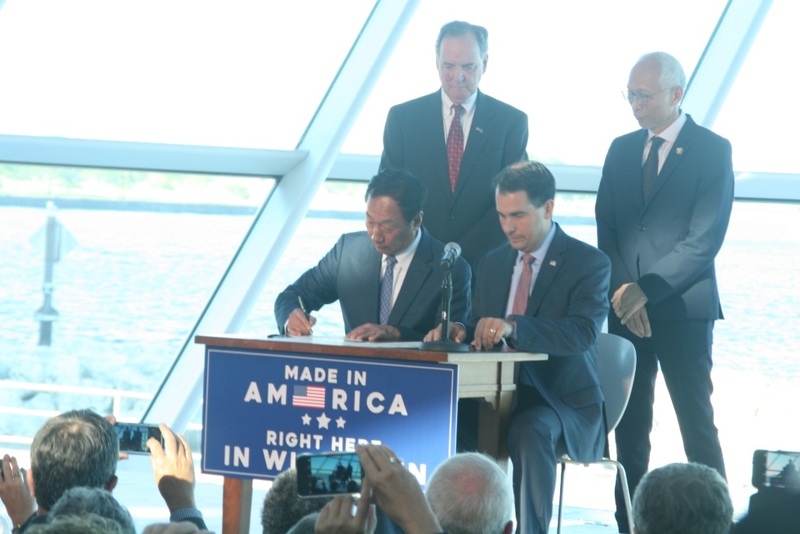 Foxconn chairman Terry Gou and Governor Scott Walker signing a memorandum of understanding. Photo by Jeramey Jannene. When evaluating government spending of the magnitude of the Foxconn proposal, it is not sufficient to estimate the benefits of the deal in isolation; consideration must also be given to the benefits that would have been generated by the money taken out of our economy to attract the firm to Wisconsin. Many citizens have reacted negatively to the potential transfer of $3 billion of taxpayer money to Foxconn, expressing concern for valuable alternative ways of spending a similar sum on our deteriorating roads, our K-12 education, and our UW system. Are the benefits to be derived from Foxconn greater than the benefits forgone? Consultants with very impressive credentials have issued estimates using the economic concept of the “multiplier.” The multiplier is an arithmetic formula meant to capture the fact that as Foxconn enters into construction and production phases, their suppliers will also add to their workforces. Since the expansion of the suppliers is due to the expansion of Foxconn, it makes sense to add supplier jobs to estimate the total jobs added. Their analyses use a multiplier in the neighborhood of 2.5 – 2.7; so if Foxconn directly adds 10,000 workers to the Wisconsin workforce, the total number of new jobs attributed to the Foxconn deal would be between 25,000 and 27,000. But, note the presumption that all the firms which respond to Foxconn’s demand for supplies, from electronics parts to paperclips, will reside within the state. There is no reason to expect this: electronic parts can be transported at very low cost per dollar value from anywhere in the world. Even the heavy construction components can be shipped by rail from sites well outside the state and even the country. Wisconsin is a tiny portion in a huge US economy full of suppliers, and the US is part of an even bigger world full of suppliers. The multiplier of 2.5 might measure the addition of jobs around the world, but as a measure of the jobs added in Wisconsin, it is far too high. But, it gets worse: even if their multiplier were measured accurately, it would be a “gross multiplier,” i.e., a multiplier that refers to Foxconn alone, without taking into account the negative effect of drawing the money totally from the Wisconsin economy. It’s as if the $3 billion fell out of the sky, having no valuable alternative use. When applying the multiplier concept to evaluate spending money that has alternative uses, we must calculate a “net multiplier” by simply subtracting the multiplier associated with the alternative spending from their estimated gross multiplier. If the money is raised by new taxes, the taxpayers lose the opportunity to spend the money according to their own preferences. If the taxpayers had instead spent that money, their spending would have had a multiplier. That multiplier would then have to be subtracted from the Foxconn gross multiplier to yield the net multiplier. Alternatively, if the money is acquired through spending cuts, say, to the university system or K-12 education or more delays in road repair, spending on those activities would have to be reduced, and the state would forgo the spending multiplier generated by those activities. Again, this requires subtraction to arrive at the net multiplier; it’s the “net multiplier” that counts, not the “gross multiplier,” when estimating the net benefit of the Foxconn subsidy. The closest we can come to spending money that has no alternative use is federal money earmarked for specific purposes, such us the money once offered Wisconsin to invest in trains, Medicaid expansion, and rural internet broadband expansion. Of course, the Governor and Legislature chose to spurn these billions of dollars. Because they were dollars from outside the state, the evaluation of the economic impact of those dollars circulating through the state economy would have a much higher net multiplier than the Foxconn net multiplier. Before the Senate votes, they should send the consultants back to their laptops to re-evaluate these estimates. As of now, they provide no valid results for the Senate to vote responsibly as they try to advance the economic welfare of the taxpayers, the workers, and the state. I appreciate your analysis regarding the Foxconn proposal. I am wondering what if any systematic efforts exist to require careful evaluation before the State Senate votes on this. What action in addition to contacting legislators do you recommend for concerned voters? This is a great point about how we never talk about what the $3 billion being funneled to Foxconn could be used for. We could get the Zoo Interchange and all other DOT projects paid for without the extra debt of borrowing, or we could avoid a helluva lot of local fees and taxes if that money was used to help local governments. These guys are a lot more legit than that Noah Williams slimeballs, but do you think this honest analysis will be picked up by Gannett and catapulted to the public like Koch Boy Noah was? Oh, and did we mention that Joint Finance is now going to try to jam the Fox-con through ASAP before more people catch on to what an inefficient SCAM it is? This article in Chicago Business explains why development of a Foxconn supply chain in Illinois is highly unlikely. The same reasons apply to Wisconsin – all the suppliers are overseas, and building new plants in Wisconsin would be a huge gamble. Additionally, about $1 billion was spent to build the failed Motorola plant in Illinois. Toyota-Mazda are currently shopping for a site to build a $1.6 billion plant employing 4,000. How does Foxconn calculate a $10 billion investment for the Wisconn plant? Seems that small communities are being asked to create TIF districts for infrastructure based on inflated promises of property tax revenues. The State is backstopping these communities for only 40% of their TIF. Also, legislative leadership is talking about borrowing $250 million to finish I-94 South. The cost of borrowing $250 million has not been subtracted in the net benefit calculation. Democrats chase businesses away, went they want to do so when out of power. this will keep them out of power. Conservatives bring people jobs. They want to work, not go on welfare and food stamps. Old Democrats: Lucey, Huber, nelson, Zablocki were pro job. Republicans play “dine and ditch” with the taxpayer. They run up the tab and then leave everyone else with the bill (not to mention the tip) at the end of the meal. How often have we heard “deficits matter” from the right wing shills for the billionaires on Fox and right wing talk radio? Apparently they don’t matter when they are run up to bail out a Republican governor who is last in the Midwest in creating industrial jobs, and is still 14,000 jobs below the pre Bush -Cheney recession total number of industrial jobs for this state. WCD how does your comment have anything to do with the analysis presented by Prof. Holahan and Kroncke? You totally missed the point! Let me make this very easy to understand. You have $10. If you give that $10 to Foxconn believing they will make your $10 into $1,000 in 25 years, you no longer have that $10 to spend on anything else. If Foxconn walks away with your $10 (like they did to the taxpayers in Pennsylvania, Brazil, Vietnam and Indonesia) you are out your $10 and there is no possibility or $1,000 in 25 years. On the other hand, if the federal government gives you $10 to spend on high speed rail, you still have your $10 and now you have an additional $10. Yes that $10 is earmarked but you have not spent any of your own money. The numbers Prof. Holahan and Kroncke quoted are not Democrat or Republican numbers. They are basic economic principles. It is because of these basic economic principles that organizations like Americans for Prosperity, a very conservative organization, have come out against this deal. Like the old phrase, it’s important to compare apples to apples, and if we can only compare apples to oranges, we have to know an effective way to do that. Here’s an article which explains the differences between economic activity, economic contributions, and economic impacts. It’s mercifully short for an academic paper, but very useful in understanding these things. It requires some analytical thought, so WCD may have to sit this one out. And no, it is not a left wing propaganda piece. Amazon , Foxconn are catalysts for us to rebuild our state as machinery and equipment manufacturing die off. This is our big chance to help regain the businesses lost by the Left: Earl and Doyle, so we have jobs for our kids and the rest of us. The whole world is watching now. They were watching when Earl drove out KC and Doyle followed with worse plans, driving out hundreds of thousands of jobs. In the same time that Doyle drove out 140,000, Tommy built 500,00. That is “huuuuge” difference. Compare Walker to Doyle: 130,000 lost to 230,000 gained. Big difference. If we blow this Foxconn deal for more welfare, food stamps, big salaries for govt. bureaucrats it will be end for tech in this state. As for Halfast trains, it is breaking Calif. and costing 4-5 times as much for a trinket, like the trolley that is useless, in this state with good roads and air. That is how Wisconsinites travel. Comparing Halfast train to job producers is like comparing the Bucks arena, trolley, in the top ten worst run cities in the country, to NML. WCD: So… you’re not going to read the article, do economic analysis based on facts and sound math, or even write coherently. Many of us here strive to construct our sentences in a way that clearly states not only our positions, but also how we gained our understanding. Sometimes, we even state high quality sources (not just general feelings or discredited partisan sites). Often times, the only aspect of your writing which can be determined by reading your posts is your general opinion. At those times you quote figures, those are often wrong. How can you expect to be taken seriously if you don’t do the work? There is no such thing as a “Halfast” train. There is in California, if they ever get it done, at ten times the price. I was Chairman of the CofC in West Allis, on board for decades and Chair of the Development committee. have read hundreds of those articles and written as many. I write in text to make short as possible. WCD: Well then, if you know how economic benefits are calculated based on sound principles, then you should encourage good math and honest statements, rather than partisan politics. It’s not just Dems that are uncomfortable with the Foxconn deal. The numbers are not accurate, and Foxconn has an extremely bad reputation, regardless of their bottom line. Why not push for a State of Wisconsin document which lays out all considerations in full transparency, including the risk? Why not push for risk management based guarantees aka “clawback”? In other words, smart government knows that you need guarantees in terms of number of jobs, wages and salaries, and the minimum amount of years which the business will provide these jobs at the locations agreed upon. I’m not even saying what the numbers should be as long as they are derived from fact and are part of a legal agreement between Foxconn and the State of Wisconsin. At the moment, we don’t have that, something which is inexcusable for any organization which considers itself fiscally responsible. WCD: if trains are useless in Wisconsin, why is Scott Walker trying to INCREASE those supposedly useless trains? Isn’t it these same Republicans who signed on to a constitutional convention demanding a balanced budget amendment to the U.S. Constitution? The opposite the states then?